CalgaryGrit: St. Paul's vote a national battlefront? posted by calgarygrit at 9:04 p.m.
Wow. A 'national battlefront?' Really? I thought the provincial by-election in Calgary-Glenmore was the national battlefront? What? St. Paul's? But seriously, that has to be the most hilariously Toronto-centric statement I've heard in a long long time. Wow. By daveberta, at 11:33 p.m. It sells newspapers. That's what's important. By Greg, at 6:43 a.m. It's not about selling newspapers, it's about setting the provincial Tories up for a fall. By DR, at 2:00 p.m. 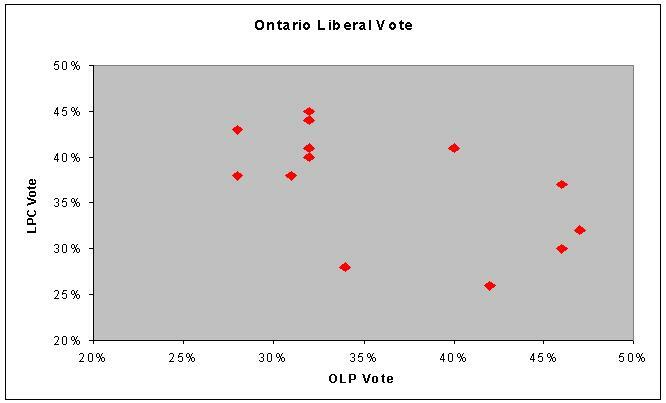 I noticed the same non-correlation between federal and provincial Liberals. Ontarians seem to like to balance things out. Therefore, I continually hope the McGuinty Liberals continue to do well! By hatrock, at 3:38 p.m.
Well byelections can be unpredictable because the turnout tends to be low (Hello Outremont - High Five), so I wouldn't actually be surprised if Ms. Levy took it. On the other hand, if I were a Grit I'd be a bit concerned about today's EKOS poll. 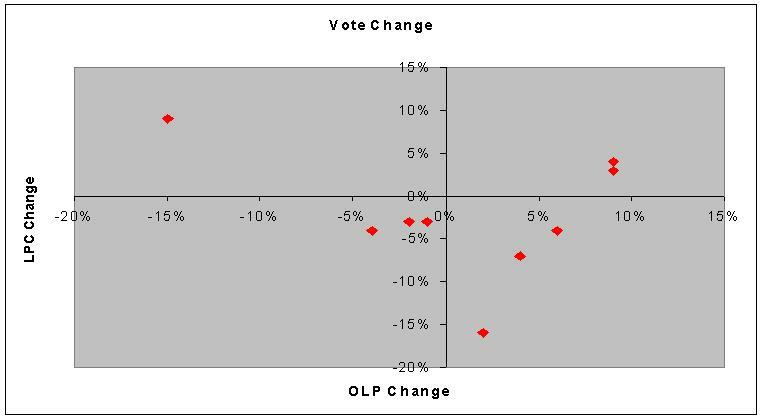 According to EKOS the NDP are having a bit of post-Dexter swoon in Atlantic Canada (which translates as Nova Scotia). If the Dippers are at 23% region-wide it likely means they are doing very well in NS, which can't be good news for the Liberals and their five seats. A stronger NDP vote likely means more Tories and Dippers, and fewer Grits. Not exactly good news for a party that needs a forty seat swing in order to take power. By herringchoker, at 7:25 p.m.
St. Paul's has always been sort of a prestige riding, where the Tories and sometimes NDP will throw star candidates sure to lose. Isabel Basset, Peter Kent, Chris Summerville, etc. But how is St. Paul's even representative of Toronto, being an affluent, fairly white enclave in an ethnically and economically diverse city? 1. People that voted for Mel Lastman in 1997 are not real Torontonians, rather they are gaudy suburbanites. 2. Ethnics and the poor, while cute, admirable, and a good source for [terribly written, sappy, and infused with fake Parkdale street cred] Joe Fiorto articles are politically irrelevant. They should just listen to us on who to vote for. 3. Good journalism is about not going very far in order to get stories. The best stories come from areas that happen to be close to Torstar headquarters, and the home of many Toronto Star employees. 4. Toronto Centre doesn't count because it has U of T students, some of whom are from Windsor and Don Valley west doesn't count because they are TOO rich to have a social conscience. So the NDP and Tories know this and use St. Paul's to showcase a "new kind of ____". The Tories can show how pro-gay and progressive they are (with a candidate guaranteed to lose), and the NDP can show how fiscally responsible they are similarly. Their candidates will get lots of coverage (if they are running in the most important riding they must be an important candidate) and they won't have to change any of their policies either. By hosertohoosier, at 9:30 a.m. I really like these tips … thanks! By Data recovery software, at 2:10 a.m.
By Fajr Alsafa, at 6:26 p.m.